but also because I am really happy with how it turned out! ... it was just feeling a little tired and in need of a change. It's not a big space, but it has to live large since we use this entrance the most; our stairway from the second floor also comes down here. I had put the stripes in some time ago, with the ultimate goal of finishing off the space with crown molding (the adjacent room, the August Blues work space, has crown molding put in by the previous owners). The large cupboard was great for storage, but it was feeling quite large in the space and I really wanted that storage to be available in our family room (anyone else struggle with Lego storage?). The shelf on the other side was ok, but it was getting bumped when we moved furniture in and out of the house, so we needed a more moveable solution. First step, put up the crown molding! I kept this low budget by using molding we already had for another project and, the best part, we found the corner blocks on clearance at Lowes - REALLY on clearance (we may have cleaned out our local store so we would have them for future crown molding projects)! We had the paint, nails, and caulk on hand. The corner blocks make the installation so easy! No fancy cuts with a fancy saw. I painted everything with primer and a first coat of paint first. I installed the corner blocks (inner and outer corners) with Liquid Nails and a couple of finishing nails to hold them in place while the liquid dried. Then I just measured in between the blocks and cut the crown molding to those measurements. A little Liquid Nails, some finishing nails and they were up (thanks to the Professor for helping me get them up!). 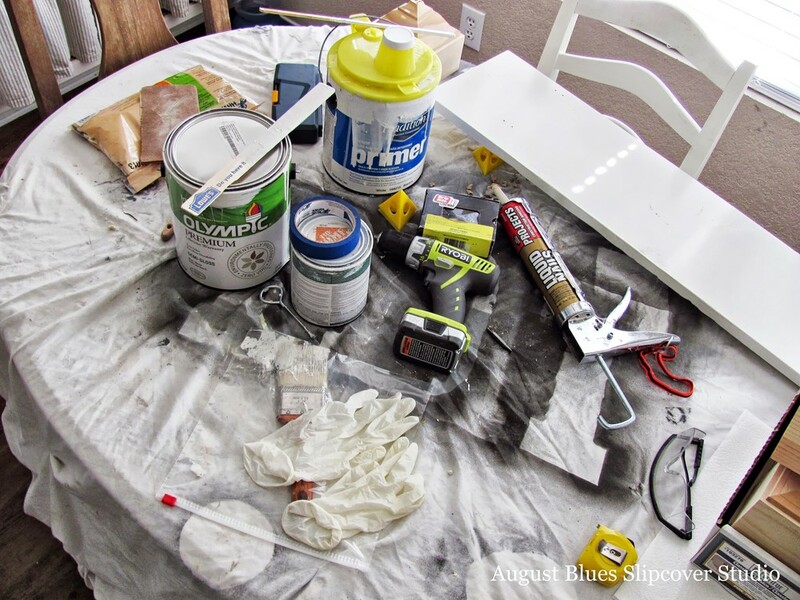 I caulked (don't miss this step! ), filled the nail holes, and painted the final coat of paint. the large metal basket came from Hobby Lobby a few months ago - it works great for the shoes I use most! the antique chest came from the guest room (after a brief stop in the family room). I love this chest! We purchased it from an antique mall while we lived in our first house. It was covered in red high gloss paint that was starting to chip. It was cute for awhile, but then the red had to go. It was quite a job, but very worthwhile! P.S. Did you catch this?